At the time of finishing the year and preparing for the upcoming New Year, there was a meaningful event to make a hopeful future with the world. 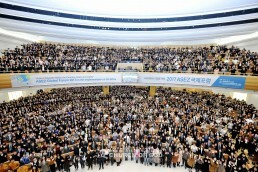 That is the 2017 ASEZ International Forum held on December 7 at the New Jerusalem Pangyo Temple for the implementation of the UN SDGs. Sustainable Development Goals [SDGs] are an agenda adopted by the United Nations in 2015 and a common goal of the international community for the sustainable development of humanity. Under the idea, “Leave no one behind,” it contains 17 goals, 169 targets, and 230 indexes the international community has agreed to implement by 2030 to solve universal problems of humanity such as poverty, disease, education, economic and social problems, and to preserve the global environment. 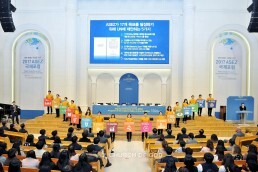 The Church of God held this forum with the purpose of drawing attention about the UN SDGs and fostering personality and knowledge of college students for their realistic and authentic activities to achieve the SDGs. 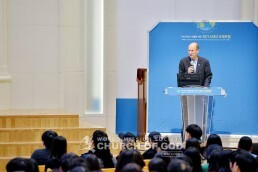 The event was attended by more than 3,000 people from 16 countries who are interested in solving social problems such as environment, welfare, and emergency relief, including 400 college students from the nation, foreign students from Germany, Tanzania, Russia, France, and the U.K., officials from Kenyan and Iraqi Embassies in Korea, professors, and journalists. The forum was organized in the following order: introduction of SDGs, implementation plan, and the role of college students. “All the global community members must work together beyond individuals, regions, and countries in order to solve global issues such as climate change, conflict, poverty, disease, and biodiversity. A mother stays with her child from the beginning to the end with devotional love, hoping her child to grow well and be happy. Likewise, the world will change if college students with intelligence and ambition serve the world on the basis of Mother’s love,” General Pastor Kim Joo-cheol said with emphasis. He also appealed to the international community including the guests to gather wisdom and will to achieve the SDGs for the world’s sustainable development and peace and for the settlement of conflicts and disputes. Then there was the ceremony to sign on the ASEZ proposal. 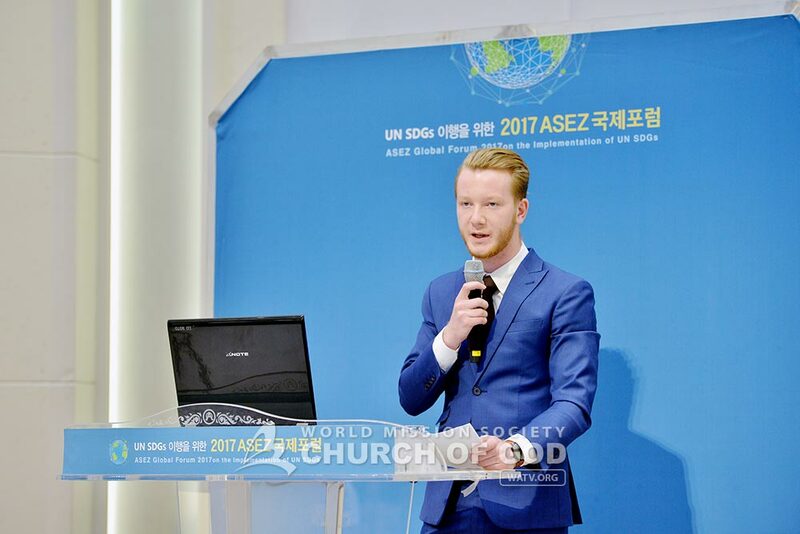 ASEZ, the university student volunteer group from the Church of God, which held the forum, was organized to save the earth with Mother’s love from beginning to end and to carry out different types of activities for the achievement of SDGs. Based on their experience and knowledge they have formulated, a proposal with five issues such as formation of global governance (cooperative management on a global scale) through expansion of university student service program, partnerships with government agencies, government offices, and universities, and designating International College Day. Over 38,000 people like diplomats, local government heads, university presidents and professors, university students and the general public, including Former UN Secretary-General Ban Ki-moon has signed to support ASEZ’s proposal online and offline. On this day, the guests who attended the forum, international students, and the student representatives of 17 cities and provinces also took part in giving their signatures. The proposal will be forwarded to the UN with supporting signatures. The second part proceeded with the introduction of ASEZ and overseas activities, guest lecture, and overseas college students’ reports. Associate Professor Emanuel Pastreich at Kyung Hee University’s Graduate School of Pan-Pacific International Studies spoke about the role of college students in achieving the SDGs and emphasized the influence of volunteer services. Hong Hui-yeong, the Executive Director of Gwanak Council in Seoul described the environmental problems in Korea and the examples of local governments’ activities to solve them and gave students a direction they should take. Paul Schynoll, a German exchange student (senior in Keimyung University), and Martha Macmillan, a Scottish exchange student (sophomore in Keimyung University) talked about refugee problems, health, and gender equality. Various supplementary events also contributed to enhancing the participants’ commitment with regard to the UN SDGs. Through the SDGs experience booths such as a panel exhibition and writing action plans, the participants could experience diverse topics including responsive measures against climate change, how to solve inequalities, and ideas to protect the ocean and land. Through the forum, the students became keenly aware of the earth and the problems mankind is faced with, and expressed their determination to achieve the SDGs through their volunteer services. What I’d understand from ASEZ is about fostering communication. I wish you good luck with it. My warmest greetings to all the members of the ASEZ! This is the newest and innovative initiative by students association of Korea that involved the civil society to raise awareness of the environmental protection which will be wholeheartedly supported by the regional countries including Mongolia. I want to congratulate all of you, ASEZ students, for participating in this conference. It’s really you who are the future, and it’s you who have to save our planet. So what you do today and what you talk about is very important. Keep on fighting! It is very meaningful for college students to discuss the SDGs. You are leaders of tomorrow and the future of the world. Particularly, you can volunteer when you have consideration for others. College students in Korea who work with Mother’s love seem to have enough attitudes of volunteers. I’m very pleased to learn of your summit to bring together students to save the world from A to Z to help us reach the SDGs and the Paris Agreement. That’s the goal we have as well, and it’s extremely important to involve the next generation in the interest of your own future, green jobs, and of course, that of a sustainable earth. We need you to join the fight. It was impressive for college students to devote themselves first and try to be pioneers in solving serious problems. Taking care of humanity with the love of a mother, who cares for her children, means that you will consider everyone as your family. If all these people come together like this, it will be a great help to fulfill the SDGs. I’m very pleased to see students participating in the UN effort to reach these goals which are extremely important. We definitely have to reduce inequalities all over the world.